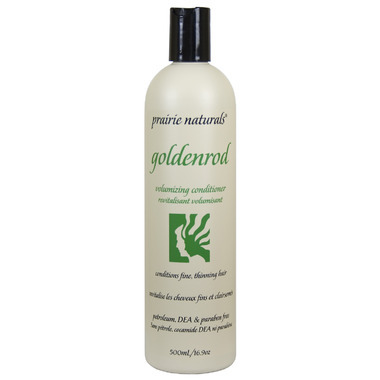 Prairie NATURALS Goldenrod Volumizing Conditioner strengthens and thickens flat, lifeless hair without leaving heavy build-up. This body-enhancing formula is infused with rich moisturizers that restore shine, while promoting maximum hair fullness. The natural botanical ingredients in Goldenrod Volumizing Conditioner improve the look and feel of fine, thinning hair, leaving it luxuriously soft and silky. Prairie Naturals Hair Care products are fragranced with pure, natural aromatic plant oils. I bought the shampoo and conditioner together, and while the conditioner is not as bad as the shampoo (which is horrible), it's still not great. It has damaged my already fine, thin, hair, rather than help it as the product description would lead you to believe.